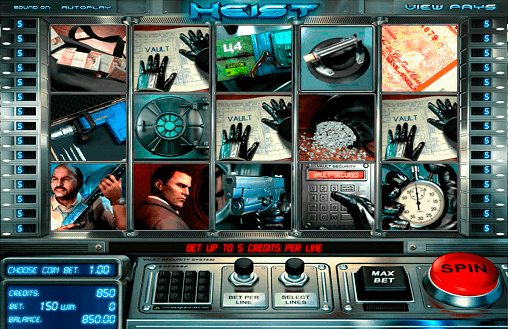 The Heist slot game, created by Betsoft, is an astonishingly elaborate online casino game experience. The opening movie tells the story of a career thief aiming to break into vault, and a determined detective bent on stopping him. The sheer amount of time that must have gone into this pre-game animated movie is mind blowing, complete with voice over narration, full 3D characters, and a completely believable plot. You would be forgiven for thinking you were watching the latest summer blockbuster But does the Heist slot game play as good as it looks, or is it just a case of all dazzle and follow through? Let’s have a closer look and find out. In the game play department the Heist slot game uses a 5 reel, 30 betting line system. Betting lines are manually adjustable, as would be hoped for. There are also a number of bonuses and special features, all of which are original, intuitive, and fit in well with the game’s theme. The player will feel as if a story is unfolding with each spin of the reels, which is a feat only a few slot games achieve as well as this. The symbols in the Heist slot game boast immense detail, as well as animating spectacularly upon being matched. The most valuable is the master thief himself, looking over his shoulder with an expression of daring. If matching him 5 times the player will likewise feel like a master thief, given how immense the payout is. The second most valuable symbol is the detective, who may not be as handsome as the thief, but he certainly doesn’t look like he messes around. There are 3 bonus games in the Heist slot game, all of which are intriguing in their design. The first is the glasscutter bonus, which is triggered by matching 3 glasscutter symbols. The player will be allowed to select 1 of the 3 symbols, beneath which a prize will be revealed. The second is the C4 bonus, which triggers upon 1 explosives symbols landing on the centre reel. The bomb will explode, turning the entire reel into wild symbols. The third bonus game is triggered by matching 3 safe door symbols. This will trigger the epic bonus game finale which the highlight of all games at real money mobile casinos. The player will be allowed to select 1 of 3 means to try and crack the vault. Each method comes with a number of free spins and a multiplier, the decision of which is completely up to the player. Upon selecting a method, a short movie will play, after which the free spins will be sent into motion. If the player manages to amass enough wins, Neil will crack the save and a further bonus will be awarded. If the player does not amass enough wins, Neil will be caught and no bonus is awarded. Either way, the sequence is suitably epic and very impressive to watch. Even if losing the jackpot, the player will feel as if they’ve watched the climax of a good movie.